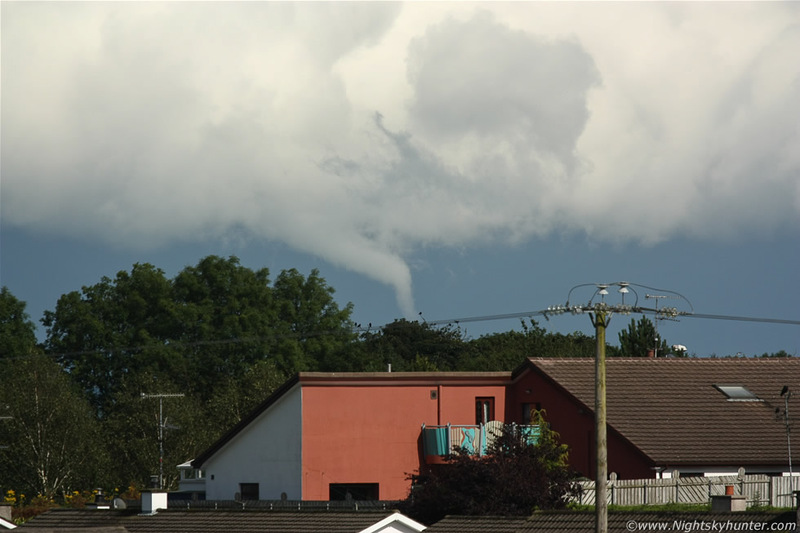 Flanking line of a severe thunderstorm over E Co. Antrim captured from Maghera on August 21st 2012 showing a beautiful strong funnel cloud/possible tornado twisting from the base under one of those sheared updraughts in the line. The funnel is 3/4 way through it's life cycle and bent acutely almost into a 90 degree angle behind the tree tops, my line of sight to the horizon was blocked so I never knew if it touched down or not and with no other witnesses it is a case of 'I will never know', however it is likely that some part of the invisible vortex below the condensation funnel was likely having a surface effect, either way it was breathtaking to watch!, read the report for more information. * All images are available for sale in the form of photo prints, canvas or digital files for licensing, if you are interested in a purchase simply drop me an email.